This is a page for miscellaneous utility programs. 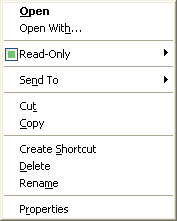 Quick Read-Only is a Windows Explorer context menu extension to allow easy viewing and modification of the read-only attribute of files. It is written in Delphi and is free and open source. 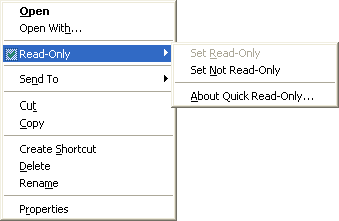 Download: Quick Read-Only 0.1.0 Setup – (Source Code). Quick Read-Only is built using Jim Kueneman’s excellent EasyNSE component set for Delphi. If you are a Delphi developer and interested in creating tools that interact with the Windows shell I would strongly recommend you check it out. It makes writing this kind of program incredibly simple and, not only that, Jim provides first-class support at his website too.